"Lord Shri Krishna replied to Arjunas query , 'I will tell you why Ekadashi is the most purifying of all days. In the Satya-yuga there once lived an amazingly fearsome demon called Mura. Always very angry, he terrified all the demigods, defeating even Indra, the king of heaven; Vivasvan, the sun-god; the eight Vasus; Lord Brahma; Vayu, the wind-god; and Agni, the fire-god. With his terrible power he brought them all under his control. "Lord Indra then approached Lord Siva and said, "We have all fallen from our planets and are now wandering helplessly on the earth. O lord, how can we find relief from this affliction? What will be the fate of us demigods?" "Lord Siva replied, "0 best of the demigods, go to that place where Lord Vishnu, the rider of Garuda, resides. He is Jagannatha, the master of all the universes and their shelter as well. He is devoted to protecting all souls surrendered to Him." "O Supreme Personality of Godhead, all obeisances to You. O Lord of lords, O You who are praised by the foremost demigods, O enemy of all demons, O lotus-eyed Lord, O Madhusudana [killer of the Madhu demonl,please protect us. Afraid of the demon Mura, we demigods have come to take shelter of You. O Jagannatha, You are the doer of everything and the creator of everything. You are the mother and the father of all universes. You are the creator, the maintainer, and the destroyer of all. You are the supreme helper of all the demigods, and You alone can bring peace to them. You alone are the earth, the sky, and the universal benefactor. "You are Siva, Brahma, and also Vishnu, the maintainer of the three worlds. You are the gods of the sun, moon, and fire. You are the clarified butter, the oblation, the sacred fire, the mantras, the rituals, the priests, and the silent chanting of japa. You are the sacrifice itself, its sponsor, and the enjoyer of its results, the Supreme Personality of Godhead. Nothing within these three worlds, whether movable or immovable, can exist independent of You. O Supreme Lord, Lord of lords, You are the protector of those who take shelter of You. O supreme mystic, O shelter of the fearful, please rescue and protect us. We demigods have been defeated by the demons and have thus fallen from the heavenly realm. Deprived of our positions, O Lord of the universe, we are now wandering about this earthly planet." "Lord Krishna continued, 'Having heard Indra and the other demigods speak these words, Shri Vishnu, the Supreme Personality of Godhead, replied, "What demon possesses such great powers of delusion that he has been able to defeat all the demigods? What is his name, and where does he live? Where does he get his strength and shelter? Tell Me everything, O Indra, and do not fear." "Lord Indra replied, "O Supreme Godhead, O Lord of lords, O You who vanquish the fear in Your pure devotees' hearts, O You who are so kind to Your faithful servants, there was once a powerful demon of the Brahman dynasty whose name was Nadijangha. He was extraordinarily fearsome and wholly dedicated to destroying the demigods, and he begot an infamous son named Mura. "Mura's great capital city is Candravati. From that base the terribly evil and powerful Mura demon has conquered the whole world and brought all the demigods under his control, driving them out of their heavenly kingdom. He has assumed the roles of Indra, the king of heaven; Agni, the fire-god; Yama, the lord of death; Vayu, the wind-god; Isa or Lord Siva, Soma, the moon-god; Nairrti, the lord of the directions; and Varuna, the watergod. He has also begun emanating light in the role of the sun-god and has turned himself into the clouds as well. It is impossible for the demigods to defeat him. O Lord Vishnu, please kill this demon and make the demigods victorious." "Hearing these words from Indra, Lord Janardana became very angry and said, "O powerful demigods, all together you may now advance on Mura's capital city of Candravati." Encouraged thus, the assembled demigods proceeded to Candravati with Lord Hari leading the way. "When Mura saw the demigods, that foremost of demons started roaring very loudly in the company of countless thousands of other demons, who were all holding brilliantly shining weapons. The mighty-armed demons struck the demigods, who began abandoning the battlefield and fleeing in the ten directions. Seeing the Supreme Lord Hrsikesa, the master of the senses, present on the battlefield, the furious demons rushed toward Him with various weapons in their hands. As they charged the Lord, who holds a sword, disk, and club, Lord immediately pierced all their limbs with His sharp, poisonous arrows. Thus many hundreds of demons died by the Lord's hand. "At last the chief demon, Mura, began fighting with the Lord. Mura used his mystic power to render useless whatever weapons the Supreme Lord Hrsikesa unleashed. Indeed, to the demon the weapons felt just like flowers striking him. When the Lord could not defeat the demon even with various kinds of weapons whether those that are thrown or those that are held. He began fighting with His bare hands, which were as strong as iron-studded clubs. The Lord wrestled with Mura for one thousand celestial years and then, apparently fatigued, left for Badarikasrama. There Lord Yogesvara, the greatest of all yogis, the Lord of the universe, entered a very beautiful cave named Himavati to rest. “O Dhananjaya winner of wealth, that cave was ninety-six miles in diameter and had only one entrance. I went there out of fear, and also to sleep. There is no doubt about this, O son of Pandu, for the great fight made Me very tired. The demon followed Me into that cave and, seeing Me asleep, started thinking within his heart, "Today I will kill this slayer of all demons, Hari." "While the wicked-minded Mura was making plans in this way, from My body there manifested a young girl who had a very bright complexion. 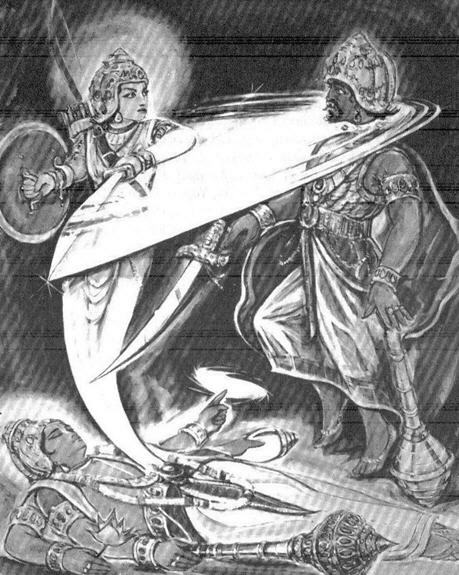 O son of Pandu, Mura saw that she was equipped with various brilliant weapons and was ready to fight. Challenged by that female to do battle, Mura prepared himself and then fought with her, but he became very astonished when he saw that she fought him without cessation. The king of the demons then said, "Who has created this angry, fearsome girl who is fighting me so powerfully, just like a thunderbolt faffing upon me?" After saying this, the demon continued to fight with the girl. "Suddenly that effulgent goddess shattered all of Mura's weapons and in a moment deprived him of his chariot. He ran toward her to attack her with his bare hands, but when she saw him coming she angrily cut off his head. Thus the demon at once fell to the ground and went to the abode of Yamaraja. The rest of the Lord's enemies, out of fear and helplessness, entered the subterranean Patala region. "Then the Supreme Lord woke up and saw the dead demon before Him, as well as the maiden bowing down to Him with joined palms. His face expressing His astonishment, the Lord of the universe said, "Who has killed this vicious demon? He easily defeated all the demigods, Gandharvas, and even Indra himself, along with Indra's companions, the Maruts, and he also defeated the Nagas [snakes], the rulers of the lower planets. He even defeated Me, making Me hide in this cave out of fear. Who is it that has so mercifully protected Me after I ran from the battlefield and went to sleep in this cave?" "The maiden said, "It is I who have killed this demon after appearing from Your transcendental body. Indeed, O Lord Hari, when he saw You sleeping he wanted to kill You. Understanding the intention of this thorn in the side of the three worlds, I killed the evil rascal and thus freed all the demigods from fear. I am Your great maha-shakti, Your internal potency, who strikes fear into the hearts of all Your enemies. I have killed this universally terrifying demon to protect the three worlds. Please tell me why You are surprised to see that this demon has been killed, O Lord." "The Supreme Personality of Godhead said, "O sinless one, I am very satisfied to see that it is you who have killed this king of the demons. In this way you have made the demigods happy, prosperous, and full of bliss. Because you have given pleasure to all the demigods in the three worlds, I am very pleased with you. Ask any boon you may desire, O auspicious one. I will give it to you without a doubt, though it be very rare among the demigods. "The maiden said, "O Lord, if You are pleased with me and wish to give me a boon, then give me the power to deliver from the greatest sins that person who fasts on this day. I wish that half the pious credit obtained by one who fasts will accrue to one who eats only in the evening abstaining from grains and beans, and that half of this pious credit will be earned by one who eats only at midday. Also, may one who strictly observes a complete fast on my appearance day, with controlled senses, go to the abode of Lord Vishnu for one billion kalpas after he has enjoyed all kinds of pleasures in this world. This is the boon I desire to attain by Your mercy, my Lord. O Lord Janardana, whether a person observes complete fasting, eats only in the evening, or eats only at midday, please grant him a religious attitude, wealth, and at last liberation." "The Supreme Personality of Godhead said, "O most auspicious lady, what you have requested is granted. All My devotees in this world will surely fast on your day, and thus they will become famous throughout the three worlds and finally come and stay with Me in My abode. Because you, My transcendental potency, have appeared on the eleventh day of the waning moon, let your name be Ekadashi. If a person fasts on Ekadashi, I will burn up all his sins and bestow upon him My transcendental abode. "These are the days of the waxing and waning moon that are most dear to Me: Trtiya [the third day], Astami [the eighth day], Navami [the ninth day], Caturdasi [the fourteenth day], and especially Ekadashi [the eleventh day]. "The merit one attains by fasting on Ekadashi is greater than that achieved by observing any other kind of fast or by going to a place of pilgrimage, and even greater than that achieved by giving charity to brahmanas. I tell you most emphatically that this is true." "Having thus given the maiden His benediction, the Supreme Lord suddenly disappeared. From that time onward the Ekadashi day became most meritorious and famous all over the universe. O Arjuna, if a person strictly observes Ekadashi, I kill all his enemies and grant him the highest destination. Indeed, if a person observes this great Ekadashi fast in any of the prescribed ways,' I remove all obstacles to his spiritual progress and grant him the perfection of life. "Thus, O son of Prtha, I have described to you the origin of Ekadashi. This one day removes all sins eternally. Indeed, it is the most meritorious day for destroying all kinds of sins, and it has appeared in order to benefit everyone in the universe by bestowing all varieties of perfection. "Whoever completely fasts on Ekadashi, following the rules and regulations, will achieve the supreme abode of Lord Vishnu, who rides upon Garuda. They are glorious who devote themselves to Lord Vishnu and spend all their time studying the glories of Ekadashi, One who vows not to eat anything on Ekadashi, but to eat only on the next day achieves the same merit as one who executes a horse sacrifice. Of this there is no doubt. Thus ends the narration of the glories of Margasirsa-krsna Ekadasi, or Utpanna Ekadasi, from the Bhavisya-uttara Purana.